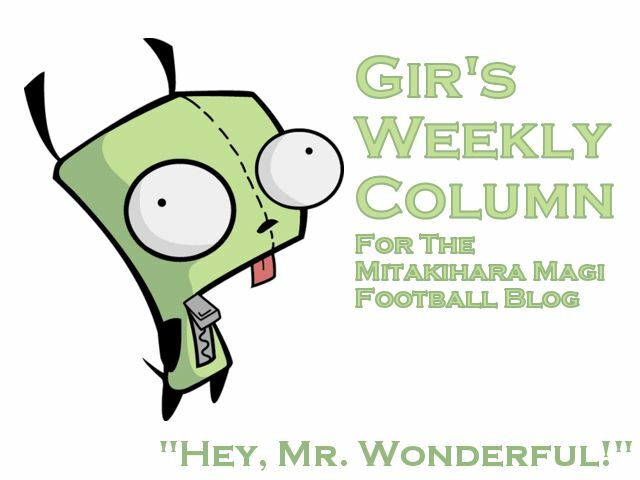 How are you all, my noble readers of The Daily Magi and the Magi Football Blog? I am Gir Todafunk, the world-famous Mr. Wonderful, here with another weekly column for you guys to gripe over. Guess what's gonna happen tomorrow? FOOTBALL! That's right, the college football season kicks off tomorrow, and we are the nightcap! Yay! So everyone on campus is getting hyped up about this game. I'm seeing rose, pink and white banners, tall signs of past and current players, and a statue of Coach Kaname surrounded by his five wives, the first family of the university...yes, I don't care that Coach Kaname is a polygamist. He didn't get arrested, he didn't get pulled over, he's not in jail, his only son is coaching down in Texas...deal with it, haters. We've spent the last week reviewing the game film for Miami, and we looked at their spring football game tape, which is what I'm told we do for every opening week opponent and any opponents that opens their season against us. We look at the spring football tape because that does not include the graduated players. Since Notre Dame is also kicking off the season this week, we don't need to look at their spring football tape. I always get my own peace of mind watching the women's volleyball team on Friday nights when we have a home game. Tonight I'm going to check out the women playing Washington. We're ranked No. 1, they are No. 2. Should be a packed house at the Kirimid. I should point this out: we played in the West Coast Conference from 2031 to 2045. I don't think this was published by the Daily Magi, but we have been a full-time member of the Mountain West since the 2045-46 college sports season. Right now, there is a decision that has to be made: should Mitakihara stay as a full time member, or return to being an associate member and play in the West Coast Conference? The people who make these choices, a.k.a. the Athletic Department, will decide in December, and the decision will take effect next sports season. Personally, I want us to be in the West Coast Conference again. Our ladies are there to throw BYU under the bus. So I can't wait for next season, when the many of the teams could be going back to the WCC. Bring it on. As for myself and my mates, bring on Miami. Next week, I will tell you how it all unfolded, from my view at least. Till then, I am Gir, Mr. Wonderful, signing off. You are not alone. And if you're lucky, we'll see you at the game.